Centered energy and a balanced life are two requisites to link productivity with a peaceful mind. 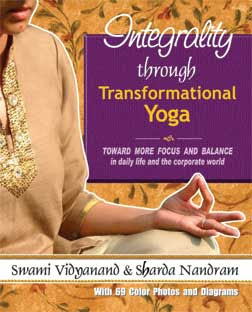 The Transformational Yoga of Swami Vidyanand offers a means to create these conditions for all those seeking improvement in their professional or personal experience. Finding meaning in a busy lifestyle focused on the outer world doesn’t work, as many managers and entrepreneurs are recognizing. Integrating business life with our inner self through the principles of Transformational Yoga will give a sense of awakened energy as the adventure of deeping our insight progresses on several levels. This book includes 69 color photos and diagrams.